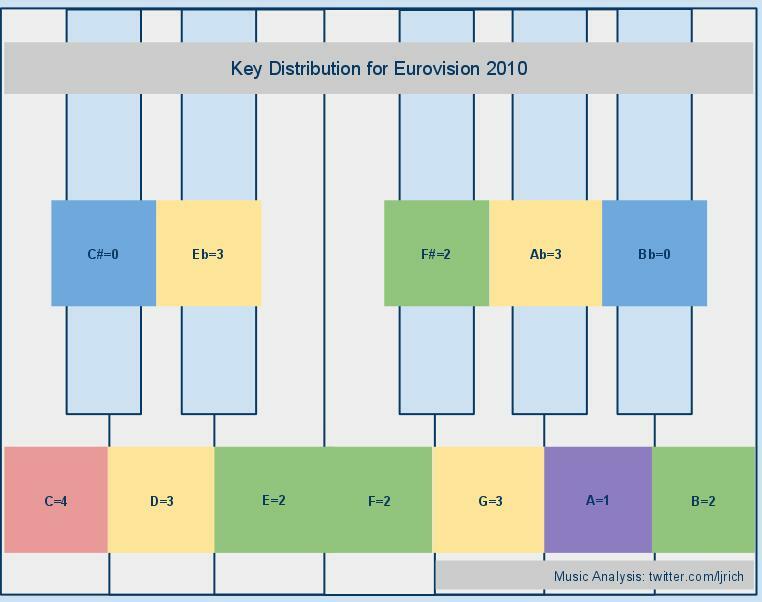 This year, I analysed the Eurovision 2010 song contest musically for The 63336… it was great fun (apart from having to listen to all the singing) and the bum notes survey picked up a few lines of coverage in the press. Below is a breakdown of how the analysis was done, along with a few extra facts about this year’s contest. We actually filled it in in entry order , though the snapshot shows the worst pitched performers and points in descending order -after the event. I counted the bum notes while someone else timed the performance in seconds, that’s how we arrived at the “bum notes per minute” stat. I based my assessment of what counted as a “bum note” on whether the singer was in tune with the backing tracks. Ad-lib note sliding (a la Mariah Carey) was not counted as out of tune unless it was truly out of tune. The most entertaining thing to do was the “additional observations” tab, where I entered song similarities in. I’m not surprised about how many songs sound like other songs – in real life if I hear something, I can generally think of a tune or two that fits quite snugly. I was surprised that in Eurovision this year, Queen, Sting and Roxette were all quoted from rather heavily. The most popular key was C with 4 songs out of 25. That’s the scale made from all the white notes on the piano – thought of as the easiest key to play in if you’re a piano player. The least popular keys were C# and Bb – with no songs in those keys. Only 9 countries went for the traditional dramatic key changes. Spain and Portugal had 2 key changes, contributing to a total of 11 shocking key changes for the evening – 13 including Spain’s Retake. Would anyone have won if they chose a folky contemporary pop song with simple chords in a minor key? Not necessarily, although Norway’s 2009 entry last year had all these attributes, and they hit the top spot in 2009. This year the winning songs were already popular and well known across the voting audience – so repetition and heavy airplay can also give a song the Eurovision Edge.